Brothers and Sisters, I feel I should begin with a confession. praying at the very heart of the nation. 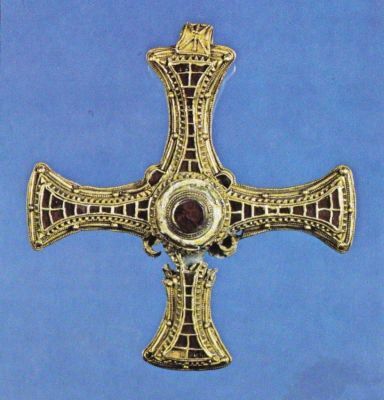 your patron, St Cuthbert, lies. I hereby confess the sin of Saint-envy. Cuthbert is such an attractive character, especially in his proto-ecowarrior guise as powerful protector of eider ducks, and close friend of sea otters. The idea of the simple shepherd-boy called to lead God’s own flock as a bishop is quite irresistible, and is reflected in today’s collect and gospel. We all warm to the idea of the man who took himself off for some peace and quiet on the island of Inner Farne, only to be beset by the great and the good, coming in boats to seek his counsel. How he must have prayed for bad weather. Of course we must be wary of projecting the motivations and concerns of our age on this 7th century bishop and hermit. His relationships with ducks and otters wouldn’t have been in the least bit sentimental, nor concerned with environmental conservation, as such. As others have pointed out, the otters that came and dried his feet, the Saint having prayed all night in the sea, came in recognition of Cuthbert’s extraordinary sanctity, through which Eden, no less, was being restored on that small Northumbrian island. Adam and Eve presumably had no end of furry mammals lining up to warm their feet of an evening. 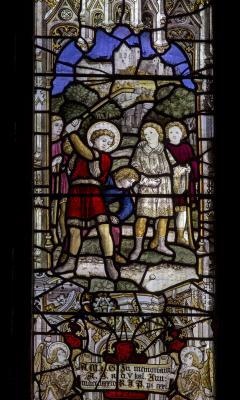 Some have suggested that Cuthbert the shepherd boy was in fact stationed on a military watch-post; more concerned with approaching enemies than with any surrounding sheep. The young Cuthbert may have been destined to be a soldier rather than a sheep-farmer before he received his call to the religious life. And as for his removal to Inner Farne, far from being an ‘escape to the country’, Cuthbert was following the example of many Celtic Saints who took themselves off to remote islands, not to have a more peaceful existence at all, but in order to do battle with their demons. They were inspired by the Fathers and Mothers of 4th century Egypt who took themselves off into the desert, where there would be less distraction from the serious business of spiritual warfare – the battle for their very souls. In the absence of any available deserts in Northumbria, a storm-battered island would just have to do. So for all we might like him to be a congenial Cuthbert, he is likely to have been a rather austere figure – not cold, necessarily, but not cuddly either. 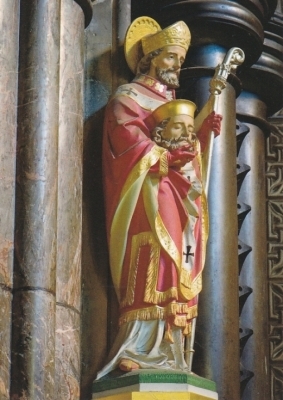 Nevertheless, I remain envious, because for all the political influence of St Edward, saintly though he no doubt was, Cuthbert represents a deeper and older spiritual influence on this land; a rugged and rooted Christianity that came out of the north and the west, with a call to holiness that echoes through the centuries. More than that, Cuthbert, along with the likes of Hilda and Wilfred, was an important figure in the eventual settlement in this land between the Celtic and Roman Churches. Cuthbert was part of that difficult process by which Britain started looking more towards Rome, becoming more part of Europe, dare I suggest - but perhaps now I am guilty of projecting the concerns of our own time – forgive me. The sheer holiness of a figure like Cuthbert will always, I suspect, leave us feeling that we are a bit puny as Christians – lacking zeal and commitment; our asceticism appearing rather unimpressive by comparison, even in Lent. But I don’t think Cuthbert would want us to be intimidated by his holiness or discouraged in our own attempts to become more holy, however meagre they may seem in comparison. The point is surely not about being heroic or extreme in our disciplines; as if holiness could be some sort of achievement, a gold medal for our exemplary ability to refuse a glass of wine, or whatever. Holiness is surely not about extremism, but about authenticity. Our culture is rather keen on extremism – the extremely good-looking, the extremely wealthy, those with extreme views; even the extremely damaged or extremely dysfunctional can generate a lot of interest. St Paul faced similar struggles in the first century. He realised that he was going to struggle to compete with the extreme interests of his age - some demand signs and others seek wisdom – he says – all we have to offer is Christ crucified. Cuthbert’s move to the island (austere though it was) wasn’t an Iron Man challenge, to prove his physical or emotional stamina; it was a humble retreat from human company in order to tackle precisely those demons that impeded his love for God and neighbour. The call that led Cuthbert to the hermitage is the same call to authenticity that we share – the call to be authentically human; creatures made to love, made in the image of God who is Love. Achieving this authenticity is no easy undertaking, for sure. Our personal demons are no less fierce today, and for some it may lead them into what seem like great physical and social privations, but no efforts in this direction are to be despised just because they seem unimpressive. All efforts at authenticity, all efforts at holiness, even the simplest Lenten discipline is to be honoured, because they are all signs of the Spirit at work in us. Although we cannot quite claim Cuthbert as the founder of Friends of the Earth, there is no doubt, in our time, that concern for the environment is part of our calling to holiness, to love our neighbour – especially those disadvantaged by others’ greed in plundering the earth’s resources; those most urgently affected by climate change. We play a part in the decisions we take every day in the supermarket or online, where we set the thermostat, the way we get from a to b. And we don’t have to be over-sentimental about our feathered and furry friends to acknowledge that they are part of the creation over which we have been entrusted. They are part, as much as we are, of the creation that in Christ is being made new. Humans living harmoniously within creation is a sign of the Eden, and indeed the New Jerusalem, which is, and always was, God’s desire for His world. And if Cuthbert was more of a trainee soldier than shepherd, perhaps it might remind us that even the most serious issues and responsibilities of our time mustn’t become the be-all and end-all (not even Brexit). Above the pressing concerns of his day Cuthbert heard a call to authenticity, to holiness, and the challenge is for each of us to work out what that might mean in practice for us, and to help each other work out what that might mean for them; knowing that no effort at holiness is to be despised, and this isn’t a one-size fits all. As children of St Cuthbert, your wonderful and enviable patron, may you be encouraged in the way of holiness, in the way of Christ, the good shepherd who lay down his life for the sheep, and offers that life to us in this Eucharist; who defends and strengthens us by his Spirit against the demons that would diminish us; and may you be blessed in every effort you make to reflect authentically the holiness of God to the world.